Welcome to Sewing Circle! 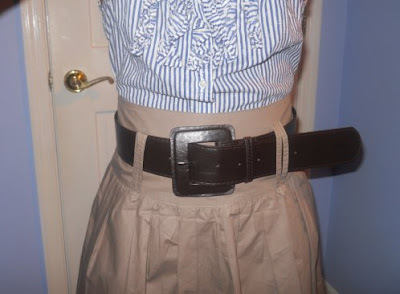 This time, I got a not-directly-related-to-sewing question about altering a too-big belt to make it lay flat. Natasha from twenty-something asked: have any quick-fix ideas on how to handle a belt that is just a little too long? I have a really beautiful belt I purchased from banana republic and I refuse to cut it...i believe i would ruin it. Unfortunately, it doesn't reach the next belt loop and it looks awful just hanging there. It is wide, so I cant fold under, as I do with the skinny belts. You are so crafty, I figured I ask for your help! :) I also attached a photo for you. Create a new, matching carrier to attach a couple inches over from the existing one. It will help to have a good leather needle if your machine will sew on leather, if you want to sew the carriers back in (they generally go between the lining and outside leather, with a row of top-stitching like it looks like your belt has. You don't have to do the top-stitching, but it will match better if you do. If you attach the carriers invisibly with something like super glue, you'll add a texture that may create bumps on your blouse and may snag or pull off, and then you'll have super glue on the nice leather inside. Hope that helps! Does anyone else have tips or ideas on fixing this problem?? If any of you have questions for Sewing Circle, please email me and let me know! i'm not sure if it work work on a leather belt, but for fabric belts (like those found on 50's dresses and such), a bit of fashion tape works wonders. If you don't mind a little extra bulk, you can fold the end of the belt under and tuck it back into the carrier. It's a lovely belt! Shorten it from the buckle end! You and usually pick it apart there and cut some off, then resew it together. The best way to do it is to punch holes using an awl, then hand sew with heavy thread. Good luck! I have that problem with a few of my belts too. Mine are not as wide as that one but it should work the same way - what I do is take a matching color hair band and wrap it around the belt to make another loop. Then I move the loop over to the end of the belt that is sticking out and feed it through. Works wonders and it's barely noticible. I've also used double-sided tape in the past but I got tired of having it re-apply it every time I wore my belts. this may be a major faux pas, but I usually just take an elastic hair tie (black or brown) and put it around my belt like a carrier. It's quick and easy and it slides to wherever you need it! Suzannah! How nice of you! I was not expecting you to post on your blog. Your readers are great. Thanks for all these wonderful ideas! I like the snaps idea particularly... seems simple enough. I think I might stop by Jo-Ann Fabrics today to pick some up. Thirding the hair-rubber band method - but specifically using the clear, flat hair-rubber bands as another carrier near the end of the belt. Cut it off from the buckle end and no one will ever know. I do what many others have said. I use a matching hair elastic. (one of those nice covered ones) and slip it onto the belt. Then I put the extra length through it. Easy and cheap! I know this is not a DIY solution, but take the belt to a shoe repair place. For $5 they will remove the buckle, shorten the belt (at the buckle end) & retach it. FYI: you can also get belts (slightly) lengthened this way -- they will also add on a small piece of leather to the buckle end & the seam is covered by the buckle & belt end.